Japanese Episode DP 041: "Hikari and Nozomi and the Double Performance!!" American Episode 505: "A Stand-Up Sit-Down!" While on the way to Yosuga City, Satoshi and his friends are approached by a Nyaruma and a Muma. 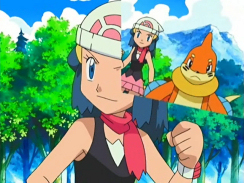 Hikari's suspicion that the pokemon belong to her old rival Nozomi is proven to be true when the pokemon lead them to her location. After they arrive, everyone sees that Nozomi has a sprained ankle and is unable to walk. After Hikari helps her back to her campsite, Nozomi shows Ayako's daughter her newest pokemon, Karakanushi. 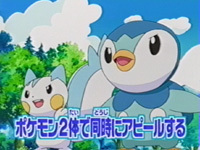 Then, she informs her rival that the Pokemon Contest in Yosuga City will be a double performance. This means that she will have to use two pokemon in the Appeals round and two pokemon in the battle round, something that Hikari hasn't trained for yet! Surprised at this new information, Hikari begins to train her pokemon for the Contest. After Hikari tries to pull off an Aqua Jet and Ice Beam combination a few times, the trainers are approached by the Rocket-Dan. The trio, dressed as Candy Musalina and her lackeys, battle Nozomi's Nyaruma and Karakanushi. As Hikari watches in awe, Nozomi manages to win the battle while combining her pokemon's moves to create a beautiful show. 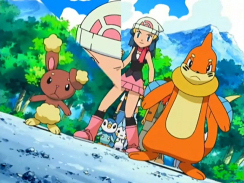 After the Rocket-Dan retreat, Hikari and the others help Nozomi get to a nearby Pokemon Center. As they leave the young Coordinator to get her rest, Hikari and her friends press onwards to the site of Hikari's next Pokemon Contest. This episode is...eh...so-so. It's not terrible, but it's not all that great either. I mean, we get to see a new pokemon for Nozomi, some training for an upcoming Contest Battle (which is always nice to see), and a random cameo by the heroine of the Raikou special. But other than that, the episode failed to hold my interest. I think a lot of it has to do with me finding Nozomi to be a very boring character. I mean, I like her better than Hikari's other two rivals, but that's not saying something since the competition is so weak. After Haruka's various assortment of crazy rivals (and no, I'm not just talking about Harley here), the ones Hikari got stuck with are pretty yawn-worthy. I hope someone injects one of these characters with a personality soon, because if they don't, we're going to have a long three years (or so) ahead of us. The dub is alright, for what it is. PUSA really makes Zoey sound like a stuck-up female dog in this episode. It's not so much what she says (since she kind of says the same things in both versions), but it's the way she says it that makes her seem like a meaner person than she really is. One example is when the gang first comes across Zoey. In the Japanese version, she pretty much says the same thing Zoey does about her pokemon brining her a noisy rival. Yet the way she delivers the lines in the Japanese version is totally different than what we hear in the dub. Originally, the tone in her voice makes her sound grateful that she's being found by people she knows. The dub, on the other hand, makes it sound like Zoey's annoyed that she has to be helped out by these people. Another example occurs after Brock yells at Dawn for saying that there's no need for a Pokemon Center. In the dub, Zoey says something about preferring to listen to Dawn talk instead, making her sound genuinely annoyed at having to put up with Dawn and all her friends. In the Japanese version, however, Nozomi wonders if Hikari and her friends will really be able to take care of her. But, she says it in a way that lets us know that she thinks these people are funny and interesting. I know a lot of this is really nitpicky, but it really stood out to me when I was watching the two versions one after another. Marion: "Marvel at the grand scale performance of the world's top Coordinator!" Um...no, Marina is not the world's top Coordinator. In the Japanese version, Momoan explains that she's a Top Coordinator, which basically means that she's won a Grand Festival. There's no doubt that Marina is a skilled Coordinator, but to say she's the best? That's just pushing it. A scene transition thingee is removed from the dub right before the scene where Dawn takes another crack at perfecting the icy Aqua Jet combo. This was most likely removed because of the commercial break that Cartoon Network put in between the two scenes. THREE SECONDS ARE ADDED TO THE ENGLISH VERSION OF THE to be continued... SCREEN.